From 9 to 13 March this year’s environmental talks are dedicated to the conservation of birds of prey in the 21st century. Eagles, falcons and vultures are magnificent indicators of the health of our natural ecosystem and the study of them has fascinated man throughout the ages. Knowing their biology, behaviour and the threats to their preservation are vital in the conservation of natural areas of high ecological value. The events organised take place in the Sala Pérez Enríquez of the ex-convent of San Sebastián from five o’clock onwards on each of the days. Day one is an introduction to birds of prey and the birds of prey in the Macronesia area. 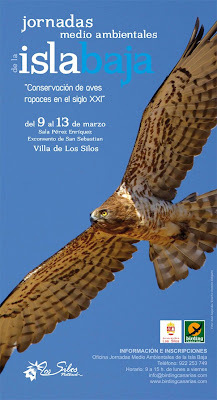 On day two the topic is the conservation of birds of prey in the Canaries, including the plan to reintroduce the red kite to the Canaries, actions taken towards the recovery of the osprey or sea hawk in El Hierro, the population tendencies, conservation and threats to the endemic species, the Canarian Egyptian vulture. Day three covers birds of prey and the cooperation for their development including the conservation of the last bearded vulture eagles in the north of Africa, the documentary, In search of the last of the bearded vultures in the world by Antonio Delgado, followed by a talk on the harpy eagle in the forests of South America and a further documentary by Avatar, Cunsi Pindo: The mistress of the monkeys. Day four concentrates on the migration habit of birds of prey including a study following the birds through the north of Spain, the birds of prey which pass the Straits of Gibraltar and migratory birds of prey in the Canaries. The final day opens with a documentary, Photographing birds of prey in the Canaries, followed by a round table talk on the future of birds of prey in the 21st century, the presentation of the prize for environmental work given annually in memory of the six hikers who lost their lives at the Piedra de Los Cochinos in 2007 and the day winds up with a drink and nibbles and entertainment by the group Circo Jam. All talks and projections are in Spanish and Los Silos has managed to put together an extraordinary group of professionals for the talks. The cost is just 40 euros for the five days but there is a limit of 120 people. To register call 922 253 749 between 9am and 3pm Monday to Friday, or email info@birdingcanarias.com.